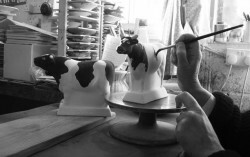 As a Production Pottery – rather than a studio pottery – we’re proud to say a great number of men and women have worked for us since the Cole family took over the company in 1947 – some local, some from far flung places, and some straight from school. 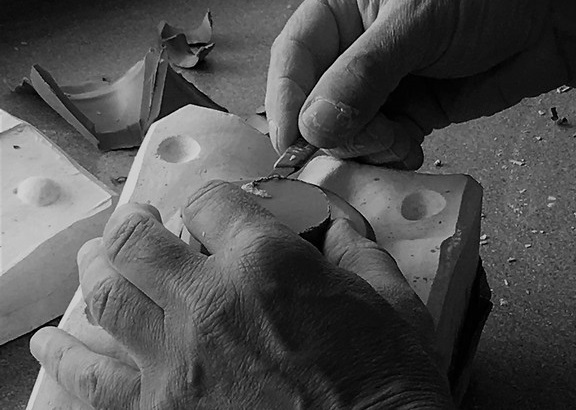 Our production principles are based on Artisanal Manufacturing and we need a highly skilled and dedicated team to be able to re-produce the spirit of our detailed designs each and every time a piece is produced. Timing is everything in the pottery business, not least in the throwing, casting and fettling shops, where lightness of touch and a well-trained eye are also key. In the decorating room, the ability to deftly apply and handle an array of colours and application tools, all of which have their own quirks and difficulties, are as important as the patience required to hand-glaze and trim all of our pieces before the painting even begins. Every step in our processes requires diligence and skill – one step skipped along the way can destroy the whole chain of pain-staking work. For the last couple of decade Rye Pottery has been initialled by individual decorators and also carries the current year’s back stamp or mark on the underside of each piece. 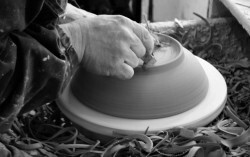 If the piece has been thrown it will also carry the throwers initial stamped into the Clay. But here at Rye Pottery we always know which pot has been created or painted by which person, while for their part, our team knows if anyone touches or even moves their work or tools, and woe betide a visitor who puts a finger mark on an unfired pot! This is our talented current team. With an ability to make our techniques look effortless, Julie Catt’s skills belie the decades she’s spent honing her incredible talent. She retired a handful of years ago, but came out of retirement when Josh & Tabby took over the business – and by goodness has she taught us a thing or two. Julie had worked for the company since leaving school over 45 years ago – we used to take the tiles to her home for her to paint when she was bringing up her small son in the 70s and 80s. 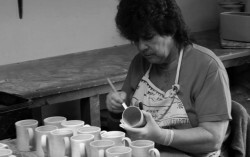 In 1998 Julie took over from the inimitable June Wooley painting all our bespoke lettered ware. She has also been critical to our hand-painted tiles for many years, and was recently featured in Channel 4’s television series Grand Designs, hand-painting our beautiful Dragonfly Tiles. Karen came to us as a 22 year-old & is now, well, let’s just say she has a teenage daughter of her own! As one of our longest-standing and highly skilled decorators, Karen has been responsible for an awful lot of our figures and animals and has recently moved into painting some of our revived and reworked tableware designs too. Now known as our Cottage Stripe Queen, Karen doesn’t bat an eye lid at painting 30cm long Cottage Stripes – which is a feat we’re all still in awe of. In a digital age it’s easy to forget what an incredible skill this is – no computers, no rulers, this is all down to a steady hand. Cool, calm, collected and unbelievably determined, we don’t know how she does it. Sara Lee originally joined Rye Pottery straight from school in the early 90s and made a very welcome return when Josh & Tabby took over the business in 2013. Her lightness of touch and strategic, yet fundamentally creative approach instantly made her an invaluable part of the company. Alongside her role painting our Current Collections, Sara is key to our Design Development team and has been integral to the recent revival and re-interpretation of some of our celebrated Mid-Century decorations. She’s thoughtful, passionate and articulate and loves the details that make our pots tick – so don’t ask her about the differences between brushes or the qualities of a particular colour & expect a short answer. She’s also an incredible teacher. Jane has recently re-joined us and over many years has decorated a vast array of our figures and animals. She also often man’s our shop at the weekends and during school holidays. Having originally trained as a teacher (she taught 8 & 9 year-olds for over 23 years) Jane is amazing with new recruits – her kind and reassuring approach never fails. As passionate teachers themselves our post-war founders Wally & Jack would have been very proud. Jane is particularly skilled at painting & decorating our English Figures & English Animals Collections. Her delicate brush & sponge work are admired in homes around the world. Well, we called her lovely Laura from the moment she arrived two years ago, and although we’ve subsequently discovered her wicked side, the name still stuck. A talented illustrator who trained at St Martin’s, Laura works with us when she’s not creating her own wonderful work. 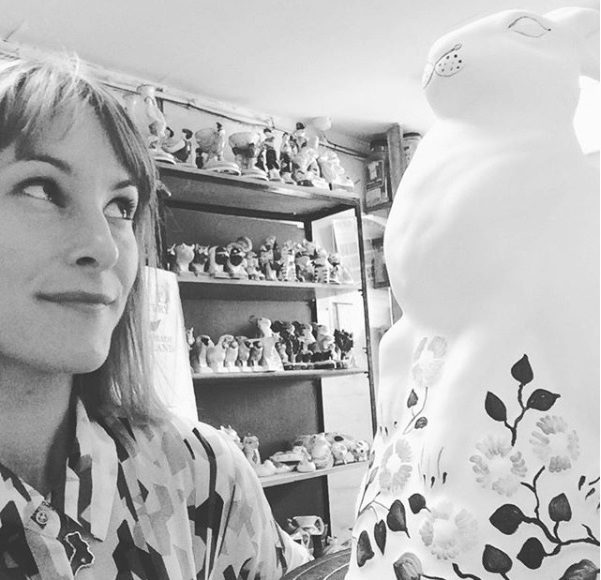 She has a fascinating spirit of fun and a lightning sense of humour and currently works most often hand-painting our animals and home wares. Having said that she’s also a regular wonder in our Rye shop. She’s a thoughtful, determined ninja-with-a-paintbrush, and is especially good at some of our quirkier figures like the Sussex Pigs and the Dogs & Puppies. 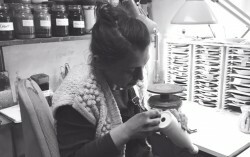 She’s also started working as part of the Rye Pottery Design Team so watch this space – who knows what we might conjure up with Laura’s input. Carrie came back to us a year ago after leaving some 20-odd years ago to live in Italy. Well, she got back into the swing of it so fast you’d hardly be able to tell she’d been away. Carrie’s lightness of touch and love of the right brush makes her an absolute natural with our technique, and we’re pleased to say she put it to good work while in Italy where she turned her hand to a not dissimilar medium restoring plaster paintings. While fond of sparkly toes, she’s also our culture queen – which makes her the perfect fit to be our historical figures specialist – injecting a welcome ( & necessary?!) dose of books, history of art, food and wine into our daily operations. And should any passing Italians ever find themselves stranded nearby, she speaks like a native to boot. She’s not with us at the moment, but we are leaving this up because she’s been a boomerang before and we love her so much we are hoping she’ll swing by again. Many of you will have met the charming Eliza when visiting our shop at the weekends. Having joined us from AG Hendy’s Home Store in Hastings Old Town, Eliza characteristically made tentative steps into painting & decorating initially but has increasingly mastered more decorating techniques. While being our Girl Friday in every, single part of the company, she’s a true creative at heart & in particular has been a thoughtful member of our Design Development team. Her ability to recreate one of our Mid Century techniques – the all-white textured Sgraffito decoration we call Tracery – is, in particular, admired by us all. Steve has been our Production Thrower for over 25 years, a skill not always appreciated by the wider world until the recent Great Pottery Throw Down series on BBC TV. It is an increasingly rare and specific ability to be able to throw pots to a specified design, in quantity and ensure they’re all the same – and Steve is our Master! His interest in potting began as a school boy when he worked for The Briglin Pottery in London followed by a stint with former Briglin potter Michael Crosby Jones when he moved to Rye. Steve particularly enjoys working with red clay, which he says reminds him of his youthful potting days at Briglin. All his work will carry the initial S stamped into the clay, alongside the painted initials of our decorators. 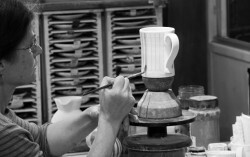 Josh gets a second mention here because he’s so integral to Rye Pottery’s overall manufacturing processes. As well as leading Design for the company Josh oversees all Production and also carries out all of our casting, Jigger & Jolly work, fettling, trimming, kiln packing, tile glazing and anything technical or creative. Or technical and creative. He’s a whizz at the chemistry and physics involved in pottery too. The upshot is that his role at the heart of both Production and Design is critical in terms of creative integrity and practicality. The amazing Betty Sayer works alongside Josh in the Trimming & Fettling room. Originally from South London and a Great-Grandmother to boot, Betty’s skills in this part of our processes are often unseen but not to be underestimated. Her deft, swift abilities with sponges and trimming knives are legendary. Newcomers are regularly left in awe by her skilled handling of a leather-hard pot or figure, and the rest of the team are always in awe of her sense of humour! Betty is guaranteed to have worked on every single piece we produce. It’s not that Julian’s shy, it’s just that, well, they really are, a very talented pair of hands. Julian works with us in the casting & fettling shop, when arguably the clay is in its most sensitive state. 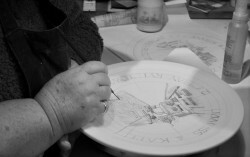 Any undue stress or pressure at this stage doesn’t show up until the piece has been painted and fired for the final time. To say he has a lightness of touch, patience and incredible hand-eye co-ordination doesn’t begin to explain his talents. Apart from a stint with us back in the day, Julian’s background is in detailed modelling – from miniscule, characterful model soldiers to exquisitely intricate jewellery sported by the rich and famous.